Of all beauty bloggers - bloggers or humans, even - my acne is probably the worst. You will agree when you see the graphic, scary photos further below. Acne struck the day I turned 21, and has been visiting on and off ever since. And, no, I did not have acne as a teen. Paradox, what? I have tried everything except Accutane (my derm won't prescribe it) - doxycycline tablets, topical applications of tretinoin, Retin-A, Clindamycin, Adalpalene Gel, Epiduo (combo), Azelaic Acid, Salicylic Acid, Sulphur-based products, Korean AC treatments, Benzoyl Peroxide from 2.5 to 10 per cent - you name it, I have used it. Which means my skin is in bad shape. My latest breakout, in August after a lot of air travel, was a veritable nightmare. I stopped doing full-face makeup looks. People were kind enough to point out that I had bad acne, in case I had missed seeing it. My GP recommended a bunch of hormone tests and scans (all normal). When I heard about the Cellnique Paramedical Acne Banisher Kit (PR Sample), I did not have much faith that it would work. Nonetheless, I tried it, and recorded my results over six weeks, as you will see below. Scroll down for my experiences with the Cellnique Acne Banisher Pack and before and after results. WARNING: GRAPHIC PHOTOS FURTHER BELOW. Cellnique Paramedical is a Malaysia-based cosmaceutical that was founded in 1996. They have a plethora of skin care products including acne treatment and sun protection. They ship worldwide and are cruelty-free. The Acne Banisher duo pack consists of two products - the Skin Action Gel Plus and the Intensive Hydrating Oasis Gel. The Skin Action Gel Plus is the spot treatment for acne, while the Intensive Hydrating Oasis Gel is a face moisturiser. The former contains tea tree, eucalyptus, camphor, Vitamin C, lactic acid, bearberry and salicylic acid. The Intensive Hydrating Oasis Gel is aloe vera-based and also contains witch hazel, horse chestnut and marine collagen. It does not contain urea. Unlike the Daniel Kern Regimen (which I followed for a couple of years - worked initially; doesn't work at all now), you do not slather your face with the acne treatment. The key here is to keep the whole face hydrated, so the sebaceous glands do not produce even more oil to combat the dryness. And, to tackle ONLY the acne inflammation with the gel. I applied the gel on my cystic acne alone. The rest of the face, I moisturised. To my surprise, the moisturiser dries to a matte finish and leaves no product on the face. This, I think, is the reason this moisturiser did not break me out. The immediate absorption and oil-free finish. So the skin gets moisture, BUT there is nothing on the surface to clog the pores because it is all drunk up very quickly by the lower layers. Also, it speeds up the healing process once the acne is past the inflammation stage. It is fragrance-free. The Skin Action Plus is the key protagonist of this set. It smells of... eucalyptus, camphor and menthol. I am sensitive to strong smells BUT could live with this. I mean, there are some fragrances which are more bothersome than others. Strong jasmine, for instance, ruins my life. Sulphur-based acne treatments make me hurl. Eucalyptus reminds me of my paternal grandmother and of warm nights. Upon direct application to the acne, it tingles or even stings depending on the quantity applied. I lost my head the first time and over-applied thinking this was another "Regimen". Yeow! I learnt my lesson and have only applied enough to cover the zit ever since. The tingling goes away soon enough and gives me the feeling that the product is actually working and not just sitting on my breakouts. The treatment did not really make my skin more sensitive, or even photosensitive, but I wore sun protection nonetheless - rain and thundershowers have chased away the sun yet again, so I could be wrong about photo sensitivity. Now, because this is strong, I recommend application only at night. Also, it does not hurt to take a break between treatments. I crashed one night last week and did not wake up with new acne. The gel takes a bit of time to dry. Overnight, you can tell the cyst has begun to dry/reduce. On the second day, it is less bumpy and painless. On the THIRD day, it begins to flake off. Yes. 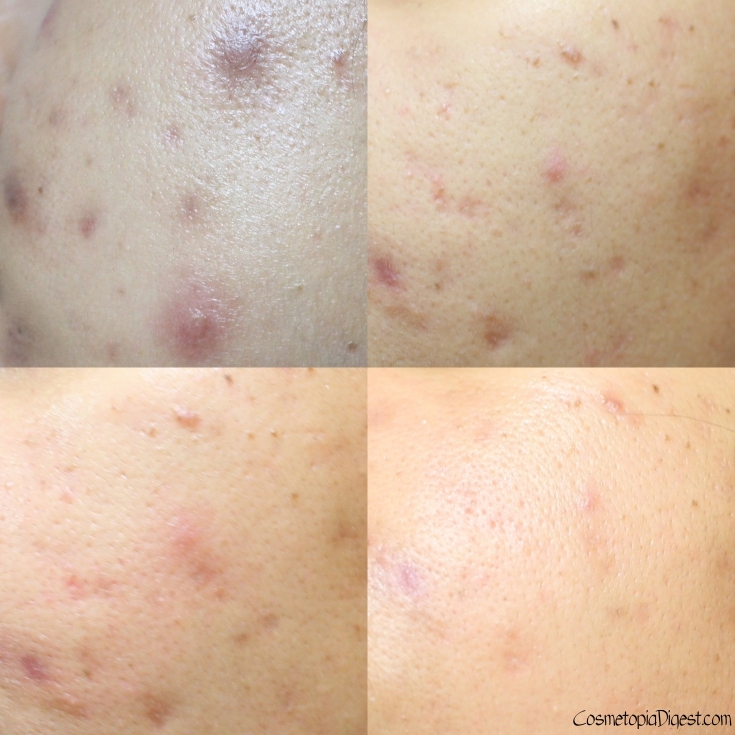 The "acne" becomes a thick scab and falls off. Believe me, NOTHING gives me as much pleasure right now as seeing my acne form scabs and fall off! I admit to encouraging the "fall of the scab" with my fingers. All I have remaining now are the scars and pigmentation - and those are fading with just the moisturiser alone. Post-inflammatory hyperpigmentation (PIH) can take up to eight weeks to fade completely. Here are before and after results on my cheek. Lighting and angle vary depending on where the photo was taken on a particular day, but you get the gist. All bare skin, no makeup/skincare. I have chosen my WORST acne so you know how it worked on something so terrible. It becomes worse. The first photo below is nightmarish, innit? The worst-affected part of my face is the chin/upper jawline. Here are results on my chin/jawline. 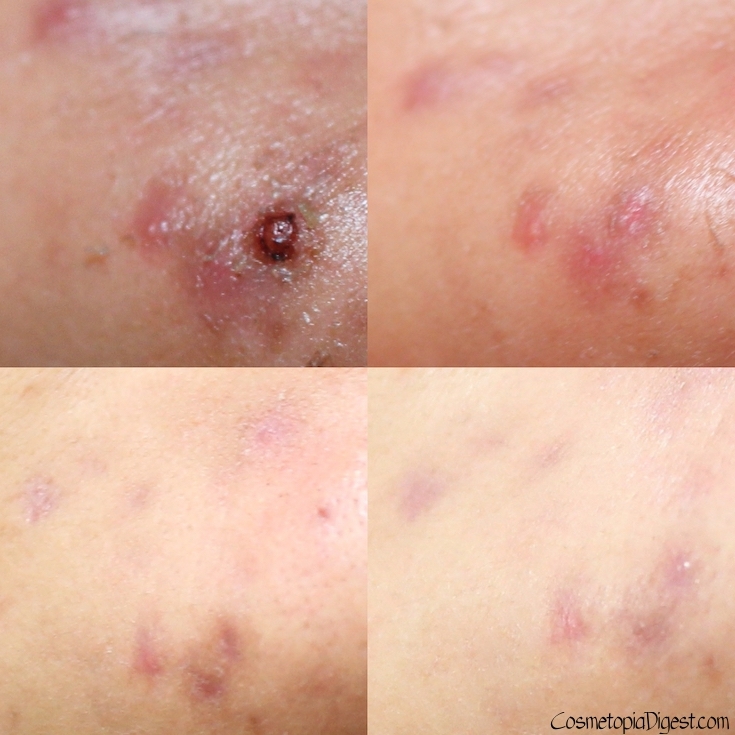 On ruptured cystic acne, the gel dried up the "pus" and closed up the skin before drying off the inflammation. No, my skin colour is the same - the first two photos are indoors while the other two are in natural light. What happens when you over-apply the Skin Action Gel Plus? Nothing happens on plain skin. But on or around acne that is healing from the Skin Action Gel Plus? This. It sort of dries up the epidermis and exposes the layer beneath. The skin heals with the moisturiser, though. The blame is entirely mine for over-applying. And for uploading the puke-worthy photograph. You saw the photographs of the results for yourself. This kit is a life-saver. I cannot believe it works so well. The Skin Action Gel Plus dries the cystic acne while the moisturiser heals the skin that dries. I do have post-inflammatory pigmentation but blame the severity of the acne for those. It will get better with time, because I usually get the pigmentation to fade only after four to six weeks. I can live with that as long as there is no more acne. And, the severity of my last breakout was a nightmare. I will be repurchasing the kit the moment I run out, but a little goes a long way, so each tube should last me for a while, especially now that my acne is under control (fingers crossed). If I got those results, then yes, I can justify the price. The Cellnique Acne Banisher kit is available here. The kit costs $94 but is worth every penny. You can also buy the Skin Action Gel Plus alone for $42 or the Intensive Hydrating Oasis Gel alone for $52. Worldwide shipping is free - and tracked. Do check out Cellnique on Facebook, Twitter and Instagram. To sweeten the deal after I made you go through all those scary photos, the company has been kind enough to provide a 15% discount for my readers, if you use code COSMETOPIADP15. You also get free samples with each purchase, and readers using my code to buy the pack get a limited edition gift with purchase. The deal is valid until November 15, so what are you waiting for? Ever dealt with acne? How? If not, how have you avoided it, you lucky thing? Tell me in the Disqus comments widget below. PR Sample. Opinions and photographs are entirely my own.